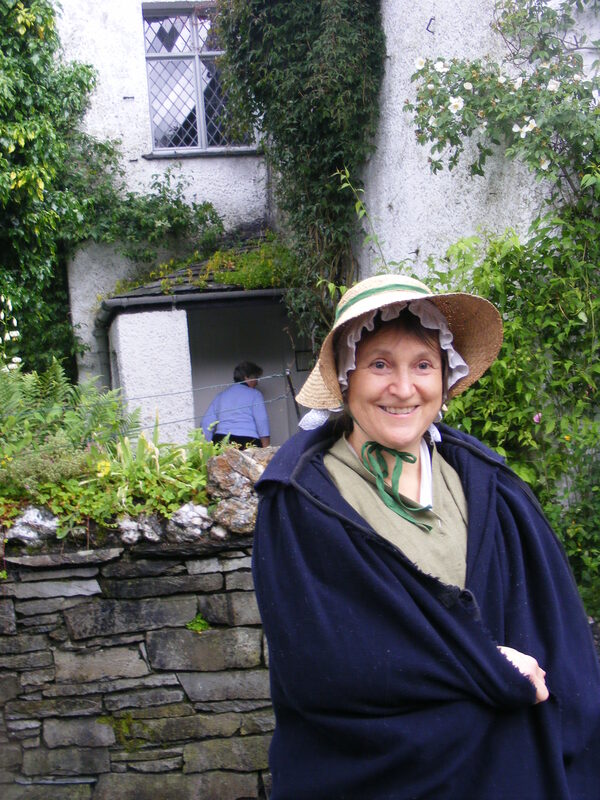 Two weeks ago today, we were privileged to spend the weekend doing living history at Dove Cottage, Grasmere, where William Wordsworth and his family lived from 1799-1808. 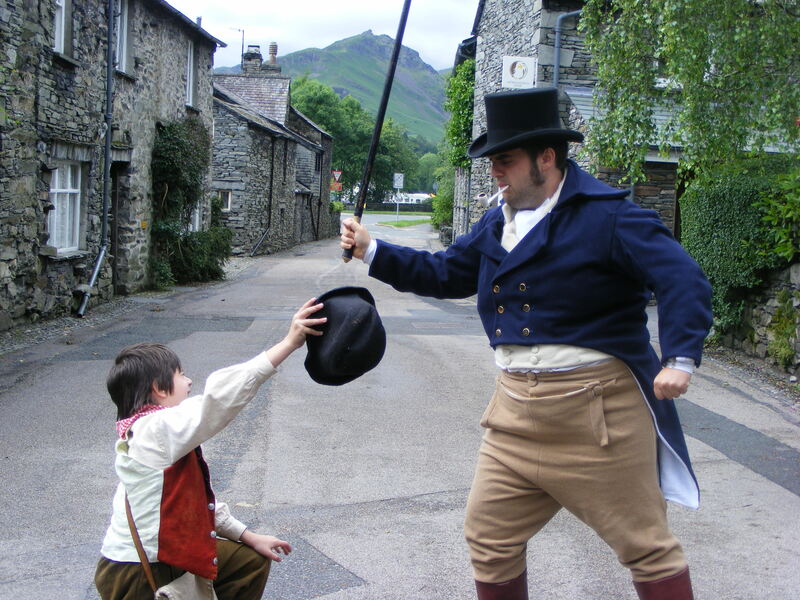 Wordsworth was a revolutionary; writing about ordinary people going about their everyday lives; finding poetry in the mundane and his environment. He wrote about beggars, leech-gatherers, the disenfranchised, and those on the margins of society. So that is what we portrayed: ordinary people. In the silence that fell on the house, between parties of visitors, we could hear nothing but the Wordsworths’ clock and the murmur and whirr of our own wheel, which was rather special. And something he would have liked to hear too, I suspect. Caro, Emma and I spun and knitted in the Wordsworths’ children’s bedroom. Which provided its own challenges in terms of the light quality (exactly the same as that 18thC and 19thC spinners had to contend with!) And also the fact I bought this Timbertops 2 flyered Chair wheel, back in the mid 1990s, but had never once set it up for two people to spin on, or even seen two spinners on such a wheel. It took us two days to figure out how to configure the drive bands, but finally, on Sunday, Emma had it sussed. (Video on YouTube coming soon). Dave and Alfi were beggars as described in Dorothy’s Journal, out in the lane. 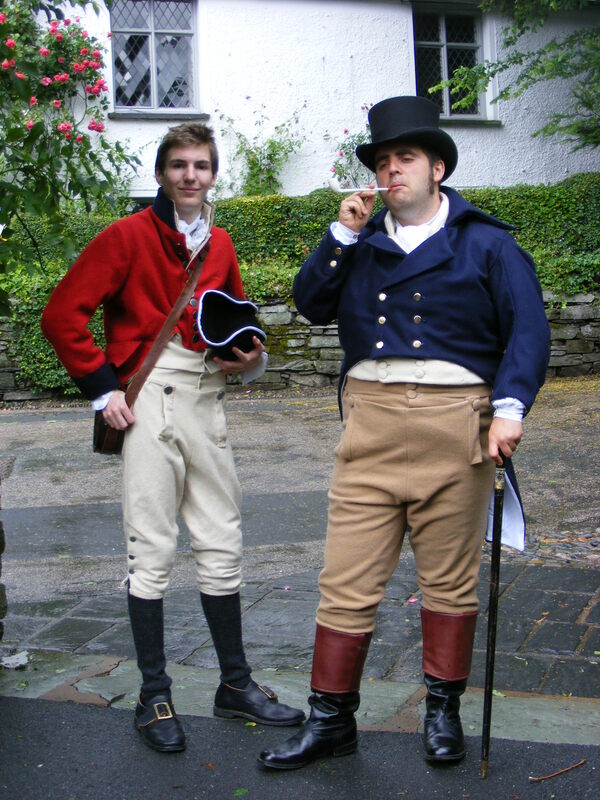 And Dan and Alex were a gentleman tourist and local Westmorland militia man, respectively. One line of my family were the Westmorland Speddings, and a great great etc grandfather, a steward to Lord Lowther, for whom Wordsworth’s father had worked. So I have a tenuous Wordsworth connection. In the 18thC, my Speddings married into the Bellas family, who were Westmorland sheep farmers and fell pony breeders. Wordsworth was friends with another branch of the Speddings. I descend from Thomas Spedding of Woodside, who married Mary Birkbeck of Kirkland at Brougham in 1701. He died in 1739, leaving goods valued at 19 pounds, 9 shillings, inventoried as: “one heifer in calf, another heifer, one gelding, bees and hens and geese.” I love the fact you could leave your bees in your will! I descend from his daughter, Barbara Spedding. The Wordsworth Trust’s Museum has a small collection of knitting sticks, some of which were illustrated by Marie Hartley in ‘The Old Hand-Knitters of the Dales’. Between working on the Gossip Wheel – and gossip – Caro and I worked on stocking knitting. I was using Wensleydale wool, for my version, on 1.5mm steel needles, and working with a goose-wing knitting stick; a typical shape stick for the Dales. 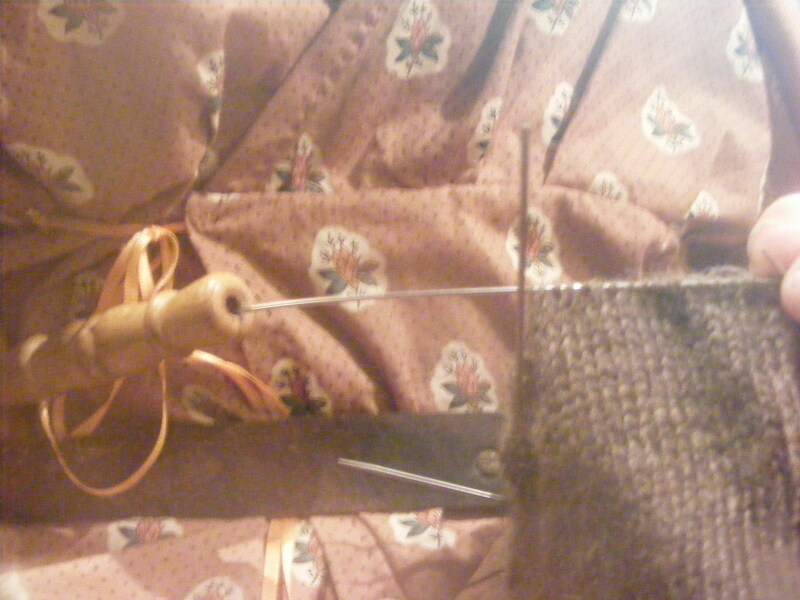 We tried to get a photo, as so many people ask how knitting sticks work. The light wasn’t great, and this was the best image we could come up with. Most of the time, the needles were more bent, and to make the stitches pop off the end of the needle, you have to work with them very close to the end. It was a Saturday of torrential rain – water was literally pouring in cataracts across the roads and was so bad, some Woolfesters got rained out of their tents, and the evening event was cancelled. There were breaks in the rain on Sunday, so the shots in Dove Cottage’s garden make it look deceptively sunny. We saw a red squirrel – I have never seen one in my life – and a slow worm, which the boys filmed. 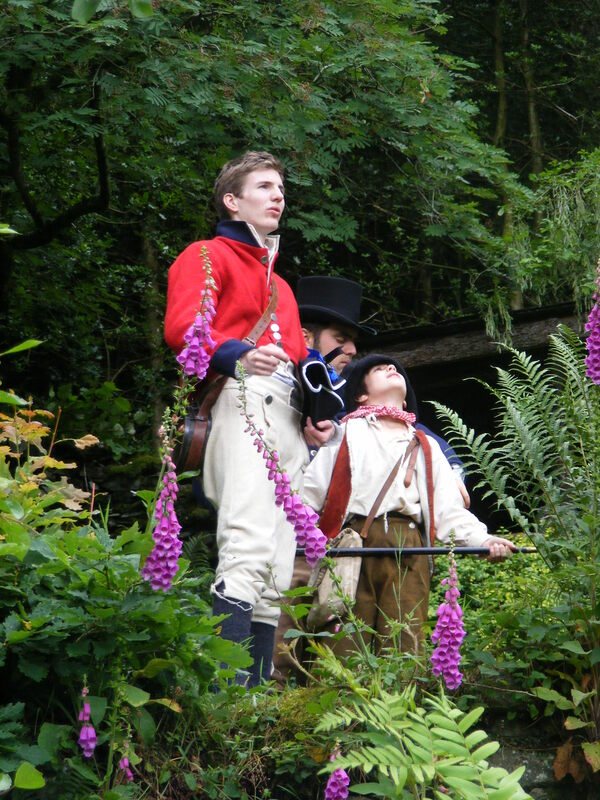 For me this is what living history is all about – bringing to life the small details of everyday life; doing what our ancestors did, and valuing the ‘ordinary’ in our histories; rather than the grand deeds of kings, queens and battles; honouring the real. Which Wordsworth would have understood. Tonight, whilst the sheep sleep on the hills, I will spin their wool, just like my Westmorland ancestors once did, and dream a little of that rainy but perfect weekend with friends and family, at Grasmere. Are you descended from the Barbara SPEDDING who married Thomas BELLAS? If so, we are cousins! Hi Dave. Yes we are cousins then! I’m a direct descendant of Barbara Spedding and Thomas Bellas, via my great grandmother, Emily Stephenson – and would love to now more about them. I’m wondering if that branch of the Speddings are anything to do with the Spedding family who were friends of the Wordsworths? This is a side-track to your excellent post, but when I read the name Marie Hartley, I was reminded that years ago I read a book by her and Joan Ingilby about life and tradition in the Yorkshire Dales. I was very excited to find that a young man was supposed to wear a clean “kittle” when he went courting – and gathered that it was a shirt or jacket. That was the name used in West Cornwall for the traditional fisherman’s smock made of canvas, bought from the Great Grimsby Coal Salt and Tanning Company. It is also the Yiddish name for the traditional white shirt that a man wears for his wedding. Just another little connection for you to file away!